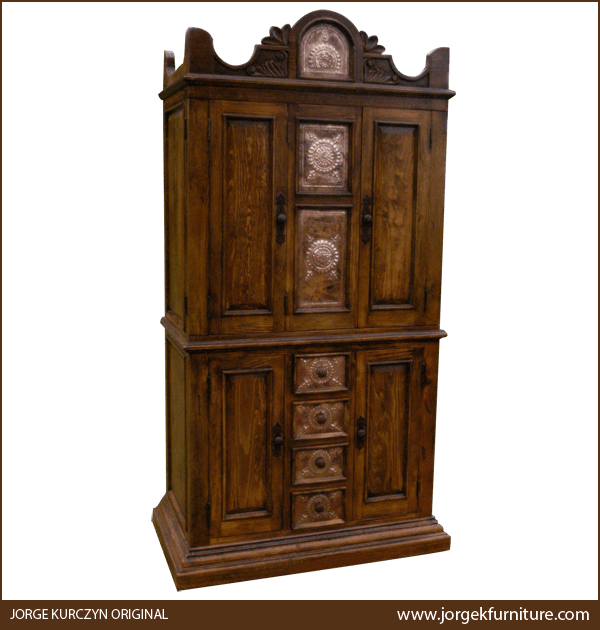 This magnificent, handcrafted, Spanish colonial style armoire features an exquisite, solid wood crest, and the structure of the armoire is embellished with opulent, hand tooled, copper panels. The arched crest is adorned with a marvelous, hand tooled, copper panel in its center, with solid wood uprights on each of its sides. The upper portion of the armoire has two, rectangular cut doors, each with a hand forged, iron handle on its side. Centered between the doors are two, rectangular, hand tooled, copper panels, and the upper and lower portion of the armoire are divided by a solid wood molding. The lower portion of the armoire features two, smaller, rectangular cut doors, each with a hand forged, iron handle. Centered between the doors are four, small drawers, and each drawer is covered with a hand tooled, copper panel. Each drawer has a hand forged, iron, pull handle in its center, and inside of each door is practical shelving for storage. The armoire has a classic finish, and it rest on a solid wood, molding base. It is made with the best, sustainable, solid wood available, and it is 100% customizable.